In the last two months of 2018, the US Gulf Coast exported more crude oil than it imported. 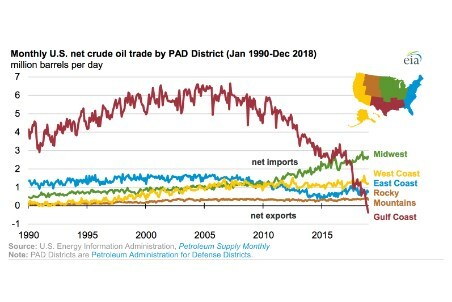 Monthly net trade of crude oil in the Gulf Coast region (the difference between gross exports and gross imports) fell from a high in early 2007 of 6.6 million bpd of net imports to 0.4 million bpd of net exports in December 2018. As gross exports of crude oil from the Gulf Coast hit a record 2.3 million bpd, gross imports of crude oil to the Gulf Coast in December – at slightly less than 2.0 million bpd – were the lowest level since March 1986. US crude oil production, particularly in the US Gulf Coast region, has increased in recent years. In November 2018, US Gulf Coast crude oil production set a new record of 7.7 million bpd. The increased production is mostly of light, sweet crude oils, but US Gulf Coast refineries are configured mostly to process heavy, sour crude oils. This increasing production and mismatch between crude oil type and refinery configuration allows for more of the increasing US crude oil production to be exported. As a result, in late 2018, US gross crude oil exports reached new record highs. Because more than 90% of US crude oil exports leave from the U.S. Gulf Coast, crude oil exports from the region also set a record high of 2.3 million bpd in December. In each of the last three months of 2018, the US Gulf Coast exported more than 2 million bpd. In addition, Gulf Coast gross crude oil imports reached record lows in the final months of 2018, with imports of 1.9 million bpd in December compared with 3.7 million bpd at the same time five years ago. In particular, Gulf Coast crude oil imports from members of the Organisation of the Petroleum Exporting Countries (OPEC) fell sharply in the final two months of 2018, from an average of 1.5 million bpd in the first half of 2018 to 1.1 million bpd in December. EIA’s latest Short-Term Energy Outlook forecasts that in 2020 the United States will begin exporting more petroleum and other liquids than it imports on an annual basis – an observation including not only crude oil but also petroleum products and hydrocarbon gas liquids.